In a reversal of greenism, Michael Bloomberg’s New York Metropolitan Transit Agency is giving up on hybrid transportation. The city with the mayor nicknamed “Nanny Bloomberg” may be stumping for all sorts of chic, activist causes, from the campaign to rid us of our Second Amendment rights, to the elimination of trans fats in our foods, to the downsizing of soda portions, but one cause the city is souring on is hybrid busses. The New York Post reports that the city hasn’t bought a new hybrid buss in three years and is now moving to retrofit many of the ones it has with diesel engines. The MTA is reporting that it will retrofit 389 hybrid electric busses with diesel engines because the hybrid engines are too unreliable and too expensive to repair. “The electric-traction motors are burning out. They’re so expensive to replace that it’ll be cheaper to stick a diesel engine in there,” a source inside the MTA told the Post. MTA officials also point out that new diesel engines are at least as fuel-efficient as the hybrids are these days, so the savings in fuel is no longer a chief selling point for new hybrids. But, despite the new efficiency of the diesel engines on the market today, it is the cost of repairs that is driving the retrofits. As it happens, the five-year warrantee is about to run out on many units of New York’s hybrid bus fleet and repair costs will soon devolve from the manufacturer to the city. The costs for maintenance will skyrocket. 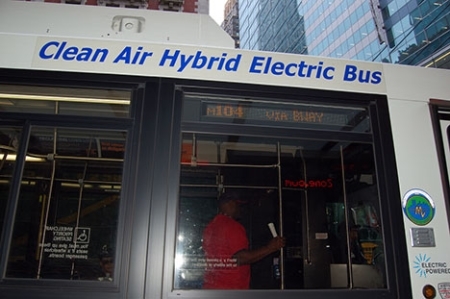 About 1,677 out of the MTA’s fleet of 5,719 busses are hybrids. Mayor Bloomberg has for years been a champion of every new chic idea that comes down the pike. He’s tried to cajole food companies into banning salt in foods, Bloomberg has eyed banning styrofoam containers, he’s banned restaurants and convenience stores from selling large soda servings, his city has even banned people listening to headphones that are too loud, those among other crusades, many of which have been shot down by the courts.